Ruhr2NorthSeaChallenge combines a sporting challenge with high-quality catering and modern technology to create a colourful lifestyle event for everyone: from the Ruhr to the North Sea – 300 km in one day! It takes place every year on the Saturday in June closest to the longest day of the year – in 2018, that’s on 23 June. The event starts at dawn, at 4.30 am. 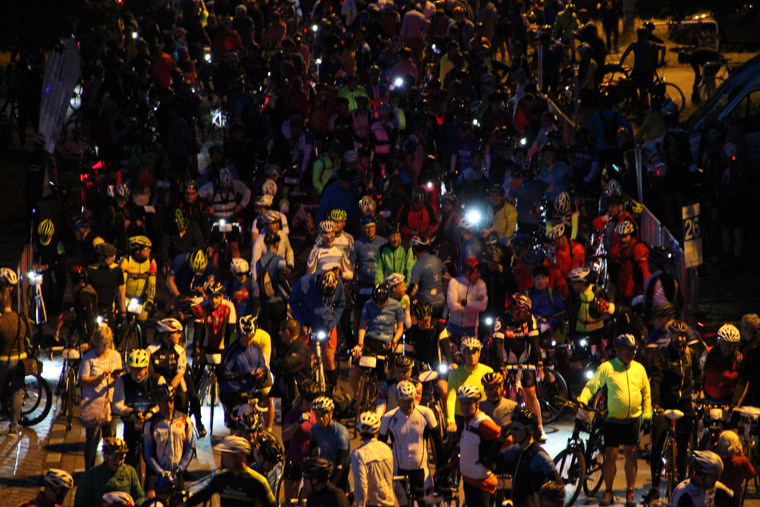 Riding at an average speed of around 18 km/h (plus two hours of breaks), the participants will reach the North Sea at nightfall (around 11 pm). In other words, the R2NSC is not a race, but is held in line with the motto “the journey is the destination”. With that in mind, there is no ranking and also no general time tracking. Navigation is ‘electronic’ – either using a bike GPS or the R2NSC app; in that way, each cyclist knows his or her own times. The almost exactly 300 km long route is fairly flat, almost completely paved and suitable for all kinds of bikes and any speed. Racing bikes will take a slightly different route to avoid frequent bends and bumpy road sections as far as possible; for all other cyclists, experiencing nature and culture will be a major focal point. To minimise risks, the route will be exclusively on bike paths and small roads and wearing helmets is mandatory. There are 8 service points providing sufficient food, drinks, WCs and other services. ‘Stranded cyclists’ can take the pick-up bus to get to the North Sea and use the transfer bus to get back to the starting point. And once the goal is reached: raise your bike in salute to the North Sea! Several sponsors are co-financing R2NSC 2018: with 40 participants, thyssenkrupp is the largest team and is supporting the 300-km event. The Stadtwerke Duisburg AG is ‘showing its colours’ at the 100-km service point and starts the R2NSC with 10 cyclists. krankikom is the start sponsor and has professionally designed the R2NSC software. From 01/04/2018 (no April Fool’s joke :-)), the new R2NSC app and the new My Tours website will be available to all participants for free. rasch.multimedia is supporting the R2NSC with its website, print products, and on Facebook. innogy will promote the R2NSC with giveaways and also the two preparatory tours and is again participating with its own team. it-motive will be handing out energy bars to the R2NSC 2018 participants at the 50-km service point and has also entered its own team. Duisburg Kontor supports our tours with professional marketing services. And the Duisburg-based company, PONY RIDERS Courier Service will be providing the R2NSC support by delivering documents to the participants – what else? And when the ‘Ponies’ aren’t delivering letters, they’ll be taking part in the R2NSC 2018 themselves.